Linear’s ACT-34B offers a cost effective means of incorporating the security and convenience of block coded transmitters into nearly any access control application. This model is sequentially precoded at the factory with unique ID codes, as well as facility codes. This coding combination represents the same level of security as a traditional Wiegand card. 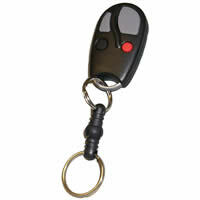 The ACT-34B transmitter is small enough to be carried on a key ring in a pocket or purse. The ACT-34B is a four-channel model that sends a unique signal from each of its four buttons. It is ideal for applications that require access control for both entry and exit, as well as when multiple remote control functions are needed, such as gate and multiple garage access. Programming ACT-31B transmitter into system memory is as simple as entering the first and last number of the coding block into the controller. Depending upon which type of controller, transmitters can be enrolled either by user-friendly programming software or manually at the controller keypad. Factory blocked to one of over 1,000,000 ID codes. Factory block coded to one of 15 facility codes.